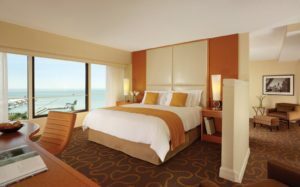 Swissotel Chicago Suite Contest – Win a Luxurious Stay at the GPA Annual Conference hotel in Chicago and Help Advance the Grants Profession at the Same Time! As a special thank you to our donors, the Grant Professionals Foundation (GPF) is offering a 3-night stay at the 2018 Grant Professionals Association (GPA) Annual Conference. The contest winner and their guest(s) will stay in a luxury suite at the Swissotel in Chicago, IL, November 7-10, 2018. The Swissotel luxury suite can easily sleep 4 (king bed, pullout couch) and usually costs $1,100 for three nights! The GPA member donating to GPF from 5/1/18 through 9/30/18 is automatically eligible to win. In case of a tie, a drawing will be held among the highest donors. It is easy to donate! Gifts are accepted online through PayPal or via the website through GPF’s Giving Well, ATTN: Helen Arnold, Treasurer, Grant Professionals Foundation, 2104 Plaza Del Fuentes, Las Vegas, NV 89102. Please make sure all donations are also documented on the Every Chapter Challenge (ECC) donation form. 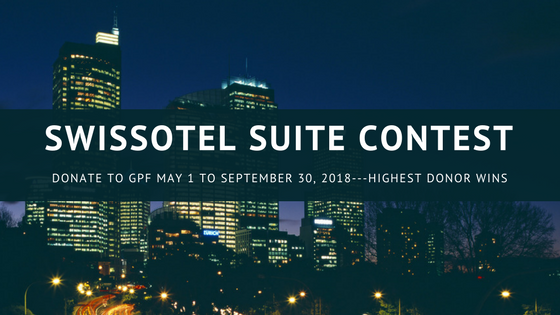 The GPA member donating the most money during the contest period wins the GPF suite for 3 nights! You can make a one-time donation or several donations during the contest period to be eligible to win.